How to equip the white winter-wonder-wasteland Pip-Boy? I just obtained the white Pip-Boy and Power Armor paint jobs during the Creation Club free giveaway promotion. I upgraded some power armor with the new paint, however don't know how to change the Pip-Boy color scheme. Anyone know how to do this on the PS4? Found it. In the Armor Workbench, the Pip-Boy shows up as an inventory item. Select it, then choose Material and you'll be presented with a list of paint jobs that you've obtained. Note: some people have found that certain mods prevent the Pip-Boy from appearing in the workbench inventory. If you don't see it, disable your mods one at a time until you figure out which one causes the problem. Not the answer you're looking for? Browse other questions tagged fallout-4 ps4 or ask your own question. How do I force NPCs to equip armor? Why is the Pip-Boy so inconsistent when invisible? Why did all my cool power armors turn into rusty T-45's? Can I select the nearest quest to my location in my Pip-Boy? 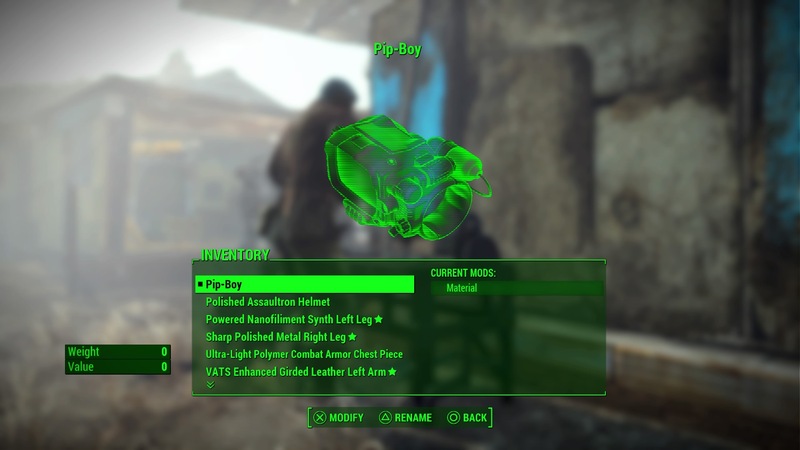 What actions count towards Fallout 4's Pip-Boy Combat statistics? What are the Fallout 4 Pip-Boy companion app network requirements? How to craft walls together at a corner when snap-in-place keeps attaching the new wall at the end?